Is It Time To Ditch That Loud, Polluting, Hard-To-Start, Smelly, Obnoxious Gas-Powered Weed Whacker? But in case you haven’t had a chance to look, the electric equivalents to gas-powered garden tools are coming on strong both in terms of power and run time. This article will focus on the venerable string trimmer aka weed eater or weed whacker. When the need arose to purchase such an item I went online in search of a suitable model. To my surprise the top Amazon listing was for an electric string trimmer. Hmm. An electric weed whacker, eh? All my homies use traditional gas-powered whackers. And complain about them routinely. So this electrified mutation needed to be investigated. Being of a slightly obsessive nature, I ended up purchasing five different electric trimmers that showed the promise of being able to match their gasoline counterparts. Why is voltage important? It’s not about power. At least not directly. One of the simplest axioms in understanding basic electricity is that power (wattage) is a combination of voltage multiplied by current (or amperage). A 10 volt motor that draws 100 amps of current uses 1,000 watts of power. Conversely, a 100 volt motor that draws 10 amps of current is also using 1,000 watts of power. Wattage is the great equalizer for comparing apples to apples. If you plugged these motors in at home one at a time, you would see your electric meter spinning at the same rate for either motor. So what’s the difference between a 10V motor using 100 amps of current and a 100V motor using 10 amps of current? It’s a big one. But let’s recast the question in the context of battery-powered weed eaters. What’s the difference between the entry-level 20 volt whackers and the 80 volt models? They each could theoretically produce the same power levels, as long as the 20V battery could put out enough current. But high current levels, as opposed to high voltage levels, require thicker, heavier components, especially the wiring. More than even an electric car, manufacturers of battery-powered tools need to be conscious of the tool’s weight. As battery design has evolved to allow more and more of those infamous 3-4 volt lithium-ion cells be strung together into a manageable-sized package, higher pack voltages become possible. Higher pack voltages mean less current to achieve equivalent power levels, so wires, switches, connectors, and even the motor itself can be made smaller and lighter. In effect, higher voltages allow for more efficient designs. The 80V weed eater I settled on weighs 13.2 lb, with the battery. That is in the same general class as similarly powered gas string trimmers. As best I understand it, there are only two brands of 80V line trimmers being marketed in the states; Kobalt and Greenworks. However, it turns out that the two brands are nearly identical (same manufacturer). But the Greenworks sells on Amazon for $348, while the Kobalt branded trimmer sells at Lowe’s for $199. The Lowe’s version also has a longer 5-year warranty on the tool itself (with 3 years on the battery). Kobalt by the way is an exclusive brand to Lowe’s Home Improvement. Lowe’s created the Kobalt brand in 1998 to compete with rival in-house brands such as Craftsman (Sears) and Husky (Home Depot). Here’s a brief walk-through of the five trimmers I was able to test out. Following that, we’ll wrap up the article with some photos of the Kobalt trimmer in action. The first trimmer I bought was a flat-out mistake. Keep in mind that the primary goal of this hunt was to identify a cordless string trimmer as powerful as a commercial gas-powered trimmer. I looked for reviews of candidate trimmers where people were claiming the cordless whacker was as effective as the gas equivalent. I must have gotten the reviews mixed up because this trimmer is not that. 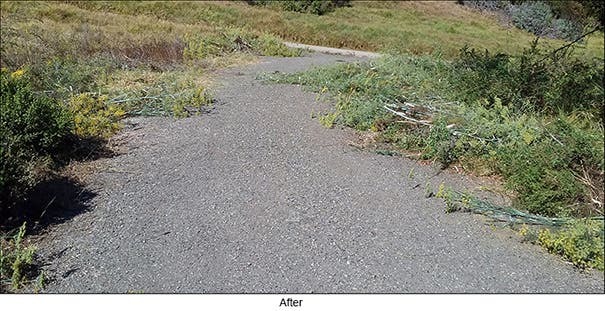 My test bed was a variety of heavy-duty weeds that grow in a coastal section of California classified as Coastal Scrub. We grow some pretty gnarly weeds here. The ascribed “light weight” Worx trimmer couldn’t even knock down the single semi-tough weed I was using as a reference. But then again the tool doesn’t claim to do so. It’s not mentioned in the description, but this unit is a “single string” design, meaning only one length of string protrudes from the head. All the other trimmers in this round-up employ an opposing dual string design. This is the 40V version of the aforementioned 80V Greenworks trimmer. I was ignorant that this model had a big brother when I purchased it. In fact ignorance ruled the purchase of the first two units because not knowing there were more powerful trimmers than the Worx, I had nearly given up on the idea of a battery-driven weed whacker. This Greenworks 40V model displaced my despondency however. It works. While ultimately not as powerful as its 80V cousins, it successfully whacked all the weeds in my test bed. 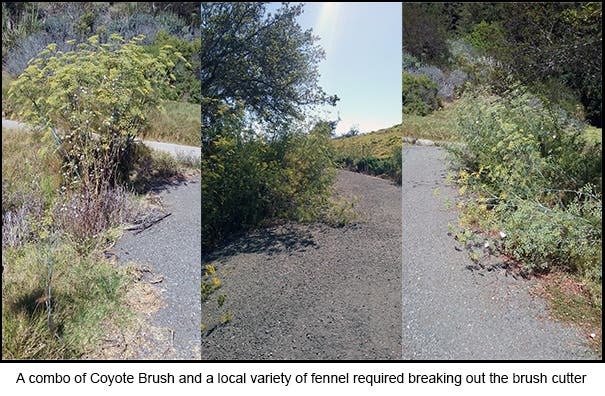 This included not only the previously pictured blackberry bushes and invasive species A, but other unwanted vegetation in the bed such as mustard seed plants. The Greenworks model is also “attachment capable,” which means you can disconnect the trimmer head from the shaft and attach other tools such as blowers, pole saws, hedge trimmers, snow blowers (! ), and other handy dandy attachments. The one disappointment with the Greenworks unit was that in high-speed mode (there is a push button to choose between two rotation speeds) the machine shut down at the drop of a hat. In even fairly light scrub if the trimmer started to get at all bound up in the vegetation the motor would shut off. A safety feature I’m sure, but it had such a hair trigger that I had to stop using high-speed mode. Which really didn’t put much of a damper on whacking my particular weeds. The test bed simply didn’t require the higher setting. If this was the only cordless trimmer on the market I would certainly have made the switch from gas to electric. If I hadn’t tested any other cordless trimmers and had nothing to compare to, I might well have kept this unit. It does do the job. It whacked all the weeds in the test bed (although it did bog down on some of the extra tough weeds outside the test bed that the upcoming Dewalt and the Kobalt models cut through). However compared to the others, the Ryobi unit is something of a beast. The trimmer specs out at a mere 11.4 lb, but I suspect that is sans the battery. The whacker felt heavy to hold and was the most unwieldy of all the units. This perception was aggravated by the fact that the motor was quite slow to get up to speed upon squeezing the power trigger. There is this kind of loudish grinding sound as the motor slowly rotates the trimmer head faster and faster. You have to stop for a moment until the machine gets up to full whacking speed. All the other trimmers in this round-up spun their motors up quickly. So, as much as I love my Ryobi cordless drill and impact driver, the company needs at least one more iteration of this trimmer before it can compete with the likes of Greenworks, Kobalt, and perhaps others. On the positive side, Consumer Reports give this model a score of Excellent, so what do I know? Right off the bat it must be mentioned that is the only trimmer other than the disqualified entry-level Worx unit that is not attachment capable. This feature has grown to be my second most important checklist item behind whacking power. So for me the Dewalt trimmer was a no-go from the get-go. Next, while all the other trimmers incorporate the motor on the shaft of the tool, the 40V Dewalt unit locates the drive motor at the bottom, above the trimmer head. So it’s a direct drive (with gearing between the motor and the head) and that seems to make for very responsive speed adjustments. However the design precludes one from being able to swap the head out for a blower, chainsaw, or various other attachments. This is a singularly purposed tool. Having said that, this singularly purposed tool is a mean little machine. I would say the Dewalt’s whacking power was nearly equivalent to the Kobalt unit. It ripped through the tough weeds handily. So as with all but the first whacker showcased in this lineup, if the Dewalt was the only battery-powered weed whacker available I’d snap it up in an instant over a gas-powered trimmer. Also, I found a use for the heretofore unneeded high-speed mode incorporated by most trimmers, when I went to work whacking tall grass. If you keep the head of any of the trimmers buried in tall grass the head rotation will tend to slow a bit. So rather than pull out, wait for the head to spin up, then nose back into the thicket, switching to high-speed mode lets you spend more time actually cutting the grass down. I actually had the experience of falling in love with this trimmer. Just unboxing it was a case of love at first sight. Maybe it was the deep cobalt blue color of her eyes — oh wait. But seriously, as soon as I held the unit for the first time it just felt right. Comfortable. Balanced. In use it is relatively quiet, with minimal vibration. By the way, watch out for reviews when people say a particular weed whacker felt too heavy to them. It’s all relative to what the person is used to. If you are used to light-duty lawn type trimmers such as the Worx, then sure, the 13.2 lb Kobalt might seem heavy. But compared to a friend’s 37cc 15.2 lb. Stihl Model FS-240, the Kobalt seems easy. As noted earlier, the 80V battery and motor combo really work well for this machine. The overall package hits every note. It is a clean, attractive looking unit, it trimmed weeds that not all the others would, and is of course attachment capable. Nothing is perfect however, and I see two possible downsides to this machine. The first is that it is an exclusive product of a BIG BOX retailer. Whether it’s Lowe’s or Home Depot, somehow these guys find ways to botch it all too frequently. So often you walk into these huge stores only to find they stock everything under the sun … except the item you’re looking for. How do they do that? The first flag in this instance was attachments. No. Wait. The first issue was that the website showed 4 of this particular trimmer in stock, but in fact there was only one single “open box” item for the corresponding SKU when I arrived at the store. Next, I had chosen to pick up the trimmer at the local Lowe’s (a 2-hour drive) rather than order online, specifically to check out the accessories in person. But there were none. Other than replacement trim line, this Lowe’s store carried no other accessories for this tool. No attachments. “You can order attachments online,” the friendly Lowe’s rep informed me. How about spare parts? Nope. No room at the huge store. As a test, I later tried to order a replacement head for the trimmer. That’s the part that houses the string and suffers the most abuse. This endeavor was attempted while the 30-day return clock was running. Guess what? No spare parts online. The only listing on the Lowe’s website was for a replacement “bump knob.” That was helpful. The bump knob is the plastic part that strikes the ground in order to feed the line out. It’s part of the head assembly. But alas, no replacement for the head itself. The somewhat mixed reviews of this trimmer on the Lowe’s item page were mostly critical of the trimmer because of its “weight” (bogus), and the lack of spare parts. One reviewer was told by Lowe’s that there was no replacement for the spring that had launched from the head upon removing it, and that the customer would have to buy a whole new trimmer. BUT, I got lucky and found a solution to the spare parts dilemma. I found a support center that sells spare parts for this whacker. You see, Lowe’s contracts with a Chinese conglomerate known as Chervon to produce its Kobalt line of tools. Kobalt in-turn contracts with a company in Canada called Sunrise for support and spare parts on just the Kobalt garden tools line. I spoke to Sunrise, and yes, they could provide the spare head that I was theoretically seeking (it ships from the US). Nice people too, those Canadians. The second concern was the battery charging time. The included charger tops off the battery in only 30 minutes. That’s a good thing in that it almost guarantees you can whack your weeds all day long with only two batteries. By the time you exhaust one battery (30 minutes to 1.5 hours run time, depending) the other one is ready to report for duty again. But if you’ve messed with rechargeable batteries much, you know that high charge rates tend to reduce battery life. That said, the engineers at Kobalt seem to have taken steps to ameliorate this dilemma. They put a fan in the charger, and cooling vents on the part of the battery that comes into contact with the charger. Think about that. Take the Tesla supercharger network, which charges cars at very high rates. It does so only as long as the battery is within a given temperature range. It’s like Goldilocks’ porridge. A Tesla only charges if it’s not too hot or not too cold. So it may be that Kobalt has locked onto the best of both worlds; fast charging with long battery life. I can tell you that Kobalt tech support in Michigan (these are the guys that turned me on to Sunrise when they couldn’t find a replacement head) informed me that even if the 3-year warrantied battery dies after 2 years 11 months have elapsed, Kobalt would send a replacement at no charge. In other words they don’t pro-rate the battery warranty. That’s great. But since even Tesla — with its sophisticated system for liquid cooling the battery — puts a cap on supercharging frequency, it would be nice to see a button on the Kobalt charger to engage a lower rate of charge. You’ve seen the pics of the test bed behind my house. 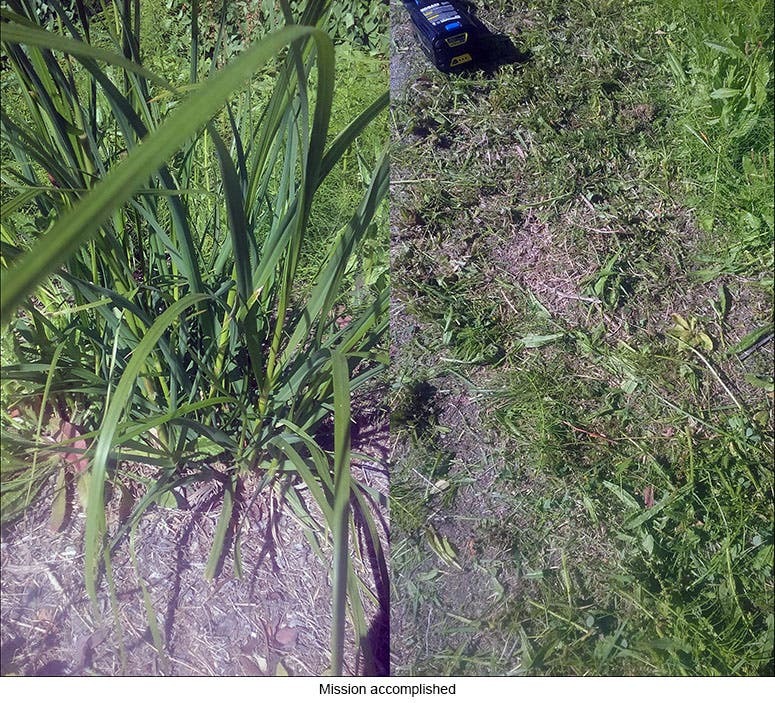 As noted, all but one of the cordless trimmers impressively cut through some rather tough weeds. I chose the best performing of the bunch — the Kobalt 80V unit — to tackle some gnarlier weeds that even a hefty gas-powered unit finds challenging. Below is a before and after photo of a tall-growing invader (Species B) that also sports a thick and fibrous base (up to 1/2″ girth). It was a bit of a fight, but the Kobalt trimmer cleared off all but one particularly beefy stalk. Changing from the stock .080″ line to a beefier .095″ line brought down even this holdout. 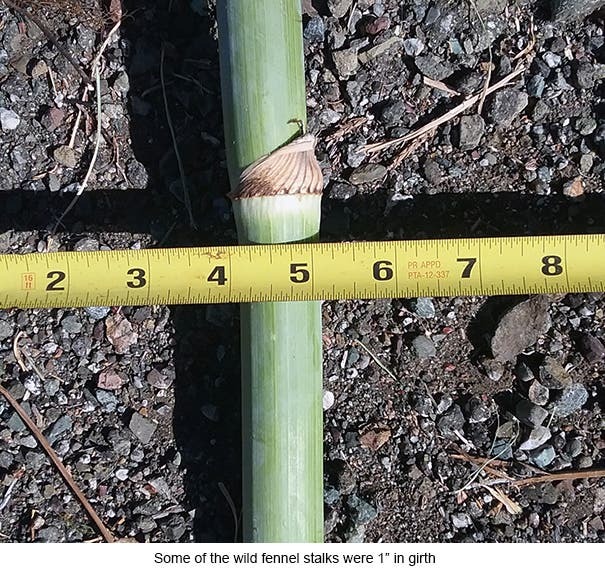 In the meantime, here’s what the Kobalt whacker did to a highly invasive species known as Pampas Grass using just the supplied line. My mission was to terminate this extremely fibrous weed. Terminate … with extreme prejudice. Next up was the nearly bomb-proof Kikuyu grass that grows all over the property. This is where I discovered a great use for high-speed mode. The trimmer cut though this vegetation easily with the head running at max RPMs. Now it was time to kick it up notch. 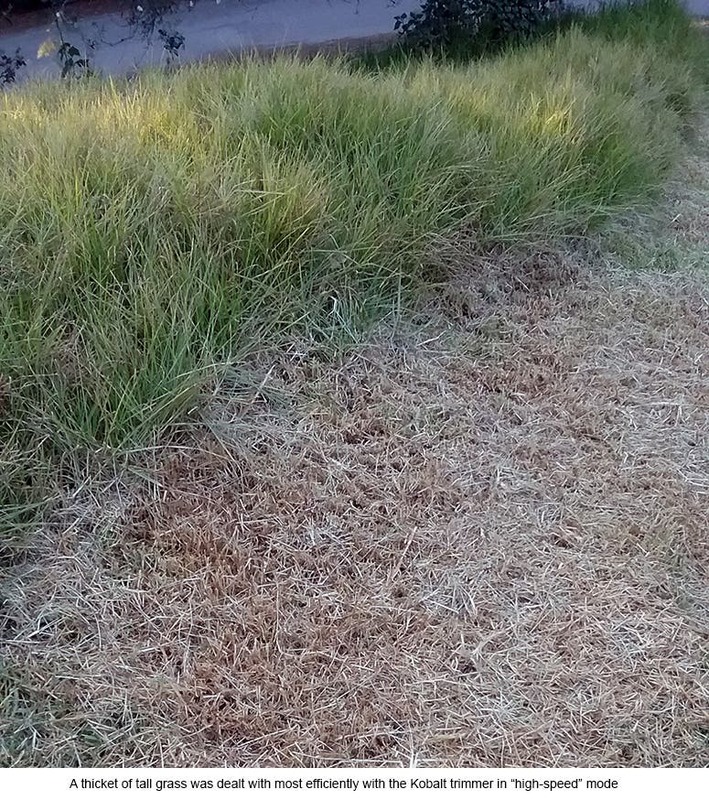 I have a neighbor with some seriously overgrown scrub that no weed whacker could conquer — with a conventional head. Like many weed whackers, the Kobalt has a removable head that can be replaced with more robust cutting heads. Bear in mind we are not talking about attachments yet, just alternative heads. Meet the well-reviewed Shakespeare Brush Cutter. The owner’s manual for the Kobalt trimmer states that brush cutters should not be used. But I saw plenty of reviews and videos for this unit where the owners had affixed such a head to their trimmers. I suspect that since Kobalt is issuing 5-year warranties on this machine, they don’t want users bogging down the motor beyond what the supplied head does with .080” line. I probably voided the warranty by popping the Shakespeare head on, but I just couldn’t help myself! And no, it did not appreciably bog down the motor. Wow. Once again the Kobalt 80V trimmer got the job done. Sure, a gas-powered unit with a brush cutter could easily have fallen this forest of feisty flora, but that’s just the point. A battery-powered tool was able to do it just as well. And the battery was charged from our solar grid to boot. So all things considered, for $200, a 5/3 year warranty, and a source for spare parts, I decided to return all the other trimmers and keep the Kobalt. As mentioned, the 80V Greenworks trimmer is nearly identical to the Kobalt 80V trimmer, but with the Kobalt trimmer boasting a stronger warranty and costing about 40% less, what’s not to love? Oh, Uh, ahem. Well maybe there’s one thing to really not love. If you live in California, Oregon, or Florida, and you’re a little ticked off at the news Lowe’s is shutting down its medium-sized subsidiary, Orchard Supply Hardware (OSH), further consolidating the retail home improvement sector, simply because Lowe’s President and CEO Marvin R. Ellison deemed OSH to be of “very small benefit to the shareholders,” you can order the Kobalt trimmer off Amazon, and at least gyp the retail stores a bit. In the meantime, if they ever remake the movie Demolition Man, perhaps not only will all restaurants be Taco Bells, but all hardware stores will be Lowe’s. Or Home Depot. Take your pick. They both leave a funny taste in your mouth. Note: Greenworks has an older 80V model (ST80L210) that sells for $200+. However, the motor is mounted over the head at the end of the tool, so it is not attachment capable. I have a friend who weed whacks for part of his living. He tried out the Kobalt trimmer. He liked it. In his view the Kobalt could handle about 80% of the kind of territory he must cover, which again is the rather gnarly Coastal Scrub. 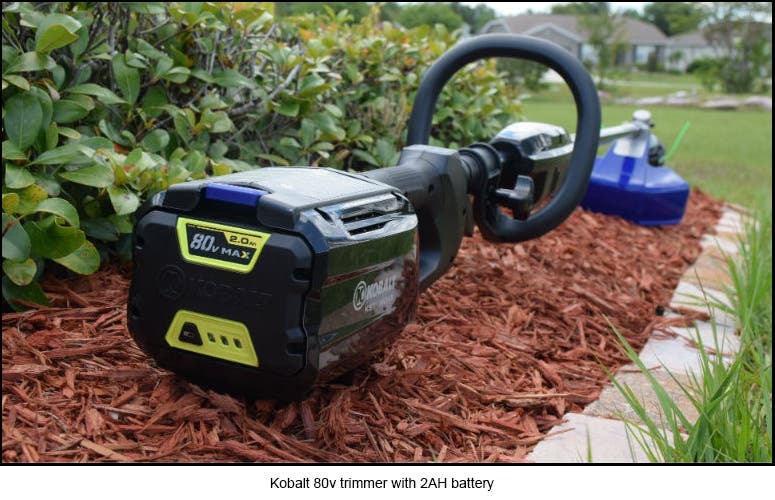 He assumed the Kobalt trimmer could even do the remaining 20%, albeit a bit slower than his $650 Stihl model 240. So yeah, it might well be time to ditch that loud, polluting, hard-to-start, smelly, obnoxious gas-powered weed whacker. As best as I can tell, all but the most serious pros could break off the relationship with their gas-powered trimmers. Any way you care to execute the breakup will do. You could slip out the back, Jack. Or you could make a new plan, Stan. Of course you don’t need to be coy, Roy. And if you’re name isn’t Jack, Stan, or Roy, foul play is not out of the question. Don’t let that evil polluter fall into someone’s hands who has not read this article. Kill your dinosaur of a weed eater. Put sugar in the gas tank. Run it over with the car. Throw it from the roof of a tall building. Use it for target practice. And then be sure to carefully wrap up all the pieces and responsibly drop them off at your local recycle center.